Jump Drive (Race For The Galaxy) Tabletop Review — GamingWithSwag.com - Dads By Day, Gamers By Night. Jump Drive is a rather curious product. Designed by Tom Lehmann of Race for the Galaxy (RftG) fame, Jump Drive is marketed as a faster, easier to play version of RftG. However, except for the iconography, Jump Drive and RftG don’t really have that much in common. This makes sense when you learn that Jump Drive is actually a re-implementation of an earlier Lehmann title called The City. 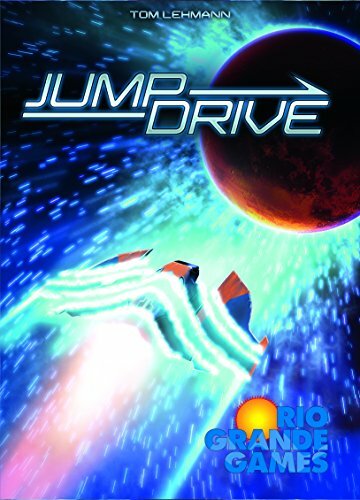 Playing Jump Drive is a fairly simple prospect. The first thing to know is that cards in your hand serve two purposes. They are the worlds and developments that you can choose to build. They are also the currency which you use to pay for those things. At the same time, players will choose whether to Explore (look at a number of cards, and draw two of them) or play cards. Players may choose to play one or two cards a turn. If players choose to only play one card, they will get a small extra benefit. After playing cards, players then count up their two main forms of income: victory points and cards they get to draw. This pattern repeats until one player has at least 50 points. Most games take 6-8 turns. It’s amazingly brisk. The rulebook is decent. It has some examples of game rounds, but I would have liked a little bit more in depth explanations as to how some things work. They do include quick reference cards for each player. I have not had to look at the rulebook once since my initial read through. It’s fairly thin, which makes sense since the game is a re-skin. I don’t think the space theme gets in the way, and if you are planning to use this as a step up to RftG, it is a good way to introduce a few of the myriad icons that game has. Honestly though, I kind of want the original game because I like city-building themed games. If you are playing with new players, set up can take a few minutes. There are recommended starter hands for players to use their first game or two, and if you’re like me, you’ve probably already shuffled those starter cards into the main deck. Fortunately, they are marked clearly, so they are easy to find. Otherwise the game is just shuffle up and deal. Tear down takes as long as it takes you to dump the cards into the box, and stick the cardboard bits into the supplied baggies. The cards are of decent quality. Though because of their dark backs, I do recommend sleeving the cards. I have not done that yet, and you can see some cards getting chipped backs already. The card design and card art look almost exactly like their RftG counterparts, and the victory tokens are exactly the same as in Race. I quite enjoy Jump Drive, but it has some issues. First of all, I am slightly disappointed at the game’s length. Yes, it is marketed at 20 minutes…and it actually hits that even with 4 players, but the ramp up from 0 to 50 points is just too fast. I don’t think the game would be hurt at all if there was just a little bit of a slower build (even just 2-3 more turns would make a huge difference). I also don’t like that only victory point chips count towards victory, as that’s not how RftG works at all. If you’re saying this is a baby Race, make it a baby Race! Finally, knowledge of the deck is a big help. Having a decent idea as to what kind of cards you might see, and being able to set yourself up to play them is a fairly big advantage. All that being said, Jump Drive is a bunch of fun, and a nice light filler that should appeal to a large number of people. I hope an expansion or two are designed that can help give the game a bit more depth.